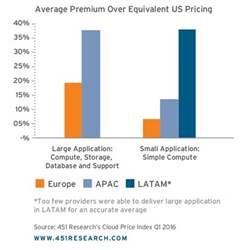 451 Research today published its latest Cloud Price Index™ report analyzing the variances in cloud pricing across the world. The findings show that US pricing is the most competitive globally while users pay, on average, between 7% and 19% more to host the same application in Europe and 14% to 38% more in Asia Pacific, depending on the complexity of the application. Latin America is the most expensive region – 38% higher on average than the US with a far greater variation in prices, in part because it has the most limited selection of providers. Reflecting global pricing cuts from AWS and Microsoft in early 2016, 451 Research also announced that the Cloud Price Index has dropped by 6% since October 2015. While this is good news for users, 451 Research analysts note that it is nowhere near the double-digit drop that many users might expect given recent headlines. 451 Research’s index measures the price change across a range of cloud services, and encourages buyers to consider the costs of all their cloud services, not just virtual machines. For example, the Cloud Price Index object storage price has remained at the same level for 18 months, and, because of data gravity, 451 Research believes this will become an increasing expense for users. 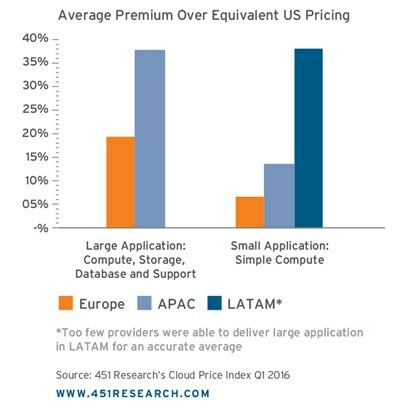 Despite the average premium pricing outside the US, 451 Research’s study unearthed one cloud provider that bucked the trend by offering services in Europe and Latin America that are cheaper than average US prices. The range of costs reflects a higher premium for large applications, composed of compute, storage, platforms and support, compared to simpler virtual machines. 451 Research analysts believe these discrepancies are due to skills shortages, compounded by an SME market willing to pay more for support when implementing complex applications. CIOs pay a ‘protection premium’ to use in-country or in-region services – rather than the cheaper option of US services – to ensure compliance with local regulations; to improve performance by bringing applications closer to users; and to take advantage of local customer service. In Europe, the biggest driver of local cloud demand is data protection legislation. Uncertainty about who has access and who has responsibility for data is confusing cloud buyers and service providers alike. 451 Research analysts believe local demand will continue given the uncertainty around legislation including Safe Harbor, the Patriot Act and the new US-EU Privacy Shield agreement. 451 Research’s Cloud Price Index is designed to give enterprises and service providers insight into the cloud pricing landscape so they can make more informed decisions when buying and selling cloud services. Like a consumer price index, 451 Research's Cloud Price Index is made up of a basket of goods, but in this case it is a specification of the services required to operate a typical Web server application including compute, storage, databases, management. For this study, 451 Research’s Digital Economics Unit surveyed 45 cloud providers, representing up to 90% of each region. Subscribers to each region of the Cloud Price Index gain access to detailed data and analysis on cloud pricing, discounting and service availability for that region. In addition, 451 Research has published a complimentary executive report on the global market, comparing the price, service availability, and market differences between different regions. Join us on March 7th for a complimentary webinar where we will use Cloud Price Index data from the US, Europe, Latin American and Asia Pacific to compare and contrast global cloud prices. Register now. 451 Research is a preeminent information technology research and advisory company. With a core focus on technology innovation and market disruption, we provide essential insight for leaders of the digital economy. More than 100 analysts and consultants deliver that insight via syndicated research, advisory services, and live events to more than 1,000 client organizations in North America, Europe and around the world. Founded in 2000 and headquartered in New York, 451 Research is a division of The 451 Group.